All these tunnel cloches are 3 metres Long x 0.45 metre Wide. 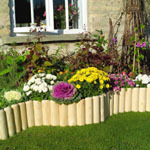 These plant cloches are manufactured from strong wire frame construction. 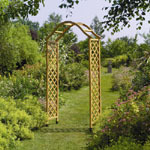 These large cloches have easy access through lift up side flaps. All the poly tunnel cloches have elasticated end closure with ground peg for security. 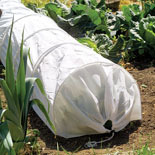 These grow tunnels are available with four cover options 1: Polythene for climate improvement and speedy growth. 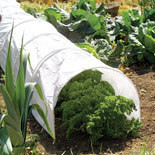 2: Fleece cover for shade, pest and frost protection. 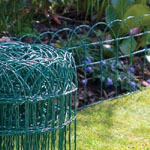 3: Netting cover for bird protection. 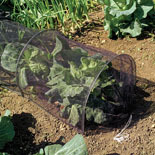 4: Micromesh cover for pest protection.